There’s just something about the iPhone 5s’ design that makes people love it so much, to the point that they forgo picking up a case to protect it – just to show off its premium design and all. Thankfully enough, the Spigen Tough Armor case for the iPhone 5s manages to maintain the handset’s iconic design, as it carefully recreates the smartphone’s spiffy good looks. And oh yeah, it’s also one tough case that’ll protect it in the event it’s ever dropped. As its name implies, the Tough Armor case isn’t messing around when it comes to safely protecting the iPhone 5s – just because it’s built like a tank, literally. Gone is the streamlined feel that we’re normally accustomed to experiencing when we grasp it naked, without a case. Instead, the Spigen Tough Armor case adds some thickness, but it’s the necessary kind that gives it some great padding. Despite the added bulk, we're still able to grasp it without much strain – so much more than other larger handsets without cases, like the Samsung Galaxy S4, HTC One, or LG G2. Taking a look at it, the Spigen Tough Armor case is comprised of two components – a spider web patterned thermoplastic urethane main body that’s heavily reinforced by a tough plastic rear frame. With the TPU interior case, it no doubt provides some much-needed shock protection in the event it’s dropped, even from lengthy heights. Meanwhile, the rear plastic frame encompasses a good majority of the rear to give the entire case some added strength – while keeping everything tightly together. Furthermore, there’s a circular cutout that allows the Apple logo on the phone to continue standing out. Access to all its various ports and buttons aren’t compromised with the case either, but best of all, the 3.5mm headset jack cutout is wide enough to even accommodate larger sized cables. Finally, there’s no worry about laying the phone flat on its screen side because there’s a 1.5mm lip between the surface of the iPhone 5s’ display and the case itself – so it won’t come in contact with surfaces as it’s laid flat. 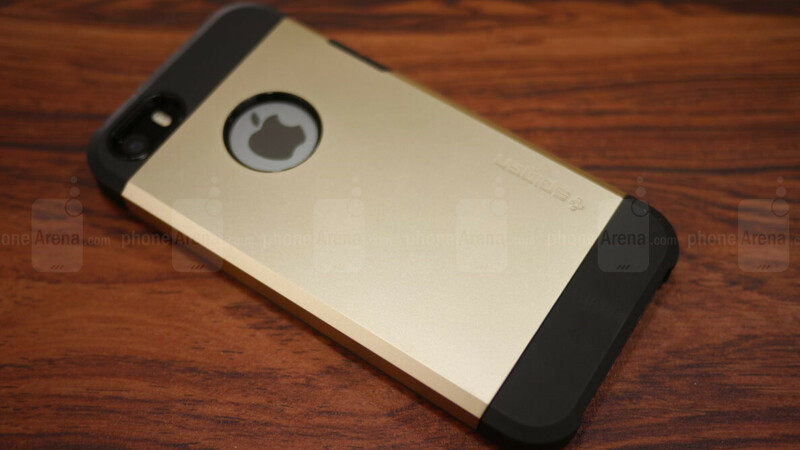 Currently, the Spigen Tough Armor case for the iPhone 5s is available in 5 metallic colors that similarly follow the handset’s existing color schemes. For those of you wondering, there’s a “champagne gold” version of the case too, which undoubtedly replicates the look of the gold colored version of the iPhone 5s. Pricing for the case is set at $29.99 through Spigen’s own web site, something that’s pretty reasonable considering its sturdy protective nature and how it maintains the iPhone 5s’ iconic design. Where are the pics that show the display other then the last pic that was put there and barely shows the display? Better yet of how the front of the phone looks sporting the case? The case is well fit n look nice but the BIG concern is the bottom of the case is sharp angel resting on pinkie is paint, hurt!!! The case is well fit n looks nice but the BIG concern is the bottom of the case is sharp angel resting on pinkie is paint, hurt!!! A good case to protect an awesome phone. Because he likes the phone and the case? Really? I have it. I just wish the back didn't scratch & scruff up so easily. Overall, I love the case. There are so many other alternatives to the OtterBox that offer just as much protection with half the size. This is one of them.